The North Yorkshire Moors Railway (NYMR) is one of the UKs most popular historic railways. For this reason, hundreds of thousands of passengers travel on the railway every year. 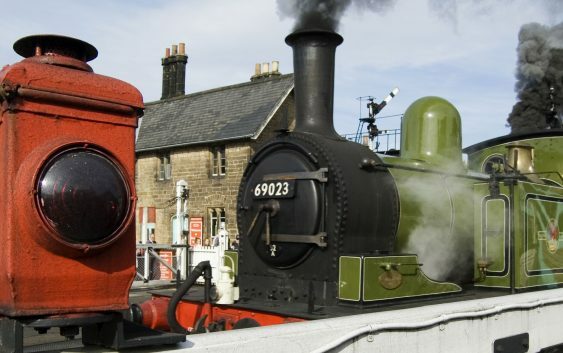 Steam and vintage diesel trains haul passengers across 18 miles of the North Yorkshire Moors. The railway runs from Pickering through Levisham, Newton Dale and Goathland to Grosmont. Trains then run on Network Rail track for a further 6 miles through to Whitby. Closed in 1965, the Pickering to Whitby line was a victim of Dr Beeching’s infamous report. Formed shortly afterwards was the North Yorkshire Moors Railway Preservation Society. Finally, the current organisation, the North Yorkshire Moors Railway opened in 1973. All stations, except Newton Dale Halt, have car parking available. Day return tickets are ‘hop-on’, ‘hop-off’ which gives the chance to explore and visit all the stations along the line. Dogs are welcome on the trains, provided they keep off the seats and tables. A ticket for a dog costs £3.00. So it’s easy to combine a day out on the railway with one of the many excellent dog walks using a NYMR station as its start / finish point. – Walk from Pickering to Levisham Village and then down to Levisham Station, catch the train back to Pickering. – Try out the Levisham circular walk exploring the North York Moors around the village of Levisham. The walk visits two spectacular places, the Hole of Horcum and the Bridestones. – Walk the 4 mile route along the old railway line from Goathland to Grosmont, with the return leg taken on the North Yorkshire Moors Railway. This is a popular walk following the route of the 1836 railway. Along the way, enjoy a range of North York Moors scenery including ancient woodland, fast flowing streams and rolling hills. The path is well-made and almost entirely flat, but keep your dog under control as many of the surrounding fields have sheep in them. – Enjoy a stroll around Whitby, or for a longer walk, the beach walk along to Sandsend and back. Pickering is a busy market town. Restored to its 1937 condition, Pickering Station has original fixtures and fittings in the Booking Office, Parcels Office and Tea Room. In addition, the old roof has been reinstated to the same design as the original roof built in 1847. Before it was axed, the railway ran south of Pickering to join the Malton to Scarborough line at Rillington Junction. Just look out from the end of the station towards Costa Coffee. Then, with a bit of imagination you can picture the route of the old line into Pickering. Levisham Station is the first stop after Pickering and looks like a typical 1912 railway station. This is a small, remote countryside station in the remote and scenic Newton Dale Valley. However, the actual village of Levisham is about a half-hour walk away. Newton Dale Halt is a request stop and serves as a stopping off point for walkers wanting to explore Newton Dale and Cropton Forest. Goathland Station is also a typical countryside station, almost unchanged since it was built in 1865. It attracts lots of visitors as a result of its appearances in Yorkshire TV’s Heartbeat (Aidensfield Station) and the first Harry Potter film. Grosmont Station has been restored to the British Railways style circa 1952 with a nearby engine shed offering water, coal and maintenance facilities. The engine shed is a short walk away and well worth a visit. The station has four platforms – one on the Network Rail line to Whitby, and three used by the NYMR. Thus, with its three platforms, level crossing, stock movements, shunting and nearby engine shed, Grosmont captures some of the excitement of railway stations in the 1940s and 50s. Whitby Station is a Grade II listed building. Over the years the station has suffered huge rationalisation. For example, the once bustling goods yard is now torn up, the signal box demolished, the overall roof removed and platforms 3 and 4 knocked down to make way for a supermarket. In August 2014, platform 2 was eventually re-opened at the station to cater for the NYMR trains. I am a frequent visitor and traveller on the railway. Below are my photos taken over the last 10 years. Many of the engines pictured are visiting engines, seen at one of the regular annual steam festivals. Double Header crossing the moors.